There are few web-friendly fonts that can supplement the readability & design of your web forms. You shouldn’t use just any font you want to because you think it looks pretty; you need to think about your customers, too. We've searched & gathered the best web-friendly fonts for your forms and have a very easy method for implementing them in your forms. 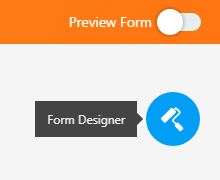 Go to your FORM BUILDER and click the blue FORM DESIGNER icon. 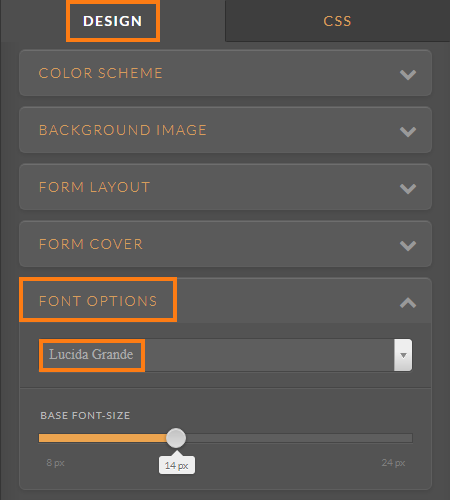 This should open the basic FORM DESIGNER panel where you can change the FONT under the STYLES tab. On that same FORM DESIGNER section, scroll all the way down and you should see the ADVANCED DESIGNER button. Clicking it will open the ADVANCED DESIGNER page where we offer way more customization options. Go to the DESIGN tab, expand the FONT OPTIONS section, then change the FONT as you see fit. 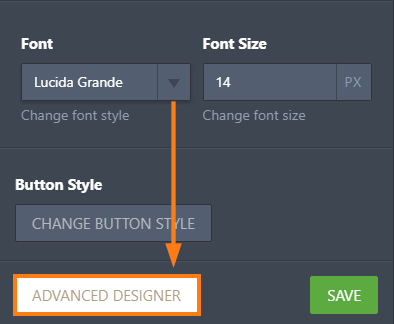 Make sure to hit the SAVE button on the left-hand side of the ADVANCED DESIGNER page to apply the changes. And that’s about all it takes to change your form’s fonts. Try different fonts to make your forms better fit your website, blog, or page. If you are familiar with Google Fonts, you can also use them on your form. Here's a guide on How to Use Google Fonts in your Form. Don't forget to comment about your experience with form fonts below! I can't change the font size because I use the option "single question by page". Is there a workaround to change the font size when I have only one question by page ? This is too big. I'm having the same issue as ThomasBDay, all i get when I open designer is choices of Palette, Themes and Custom. There's no option for me to change layout to legacy as was suggested in response to ThomasBDay's question. Fonts are changing when converted to PDF even after I have followed the steps above. I went in and changed the font family on the designer tool and in settings but when I convert the document to PDF it is giving me a different font on the text boxes and rating scale. How I can use a font source other than Google fonts, but is included in my project? What about the font weight? I want to remove the bold in the text field labels. I am trying to change the font of my Header and Sub Header to Tahoma font but every time I try, it reverts back to its default. I have tried both methods shown above but to no avail. This does not seem to allow different font sizes in different text boxes - does it all have to be the same font within the entire form? Thank you. How do I change fonts? How can I change font of the form? Howto change fonts in the new layout? 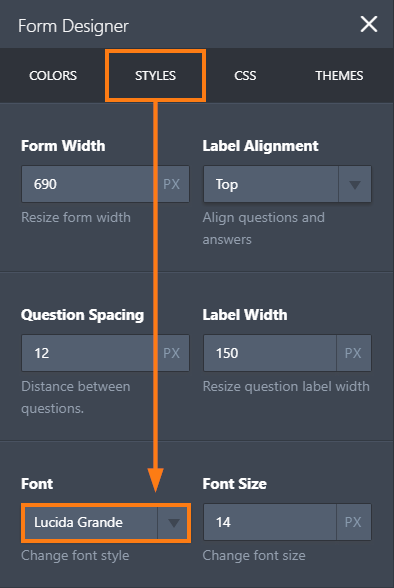 how do you change fonts on forms? How to use our own purchased non-standard font and colours in form?